Are you interested in learning more about retirement planning? The site offers a wide variety of learning options including book and library resources. workshops, conference topics and one-on-one consultation (on-site or distance). If you have a question about retirement in Canada, contact us for input. Three of Canada’s foremost retirement and life educators bring their collective insights, experience and knowledge to bear on the problems that Canadians face in planning retirement. 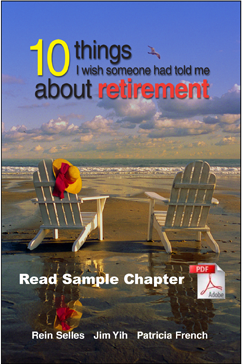 A personal exercise concludes each chapter allowing readers to apply each principle to their own life and retirement plans. writes for Canadian Business, MoneySense and Globe and Mail. writes for Canadian Capitalist and MoneySense.